Want to listen to music via a 3.5mm audio source, while simultaneously charging an iPhone? That used to be easy, but all new iPhone models have done away with the longstanding headphone jack, which once allowed users to easily connect their iPhone to home stereo systems, car stereos, headphones, and other speakers and audio interfaces via the 3.5mm AUX port, while still maintaining the availability of the Lighting charger port. With the familiar AUX port gone for good from iPhone, Apple now instead offers a dongle connector with every new model iPhone X, iPhone 8, iPhone 8 Plus, iPhone 7, and iPhone 7 Plus devices. The dongle serves as an adapter interface allowing you to plug it into the Lighting port, and then connect to an AUX cable if need be. 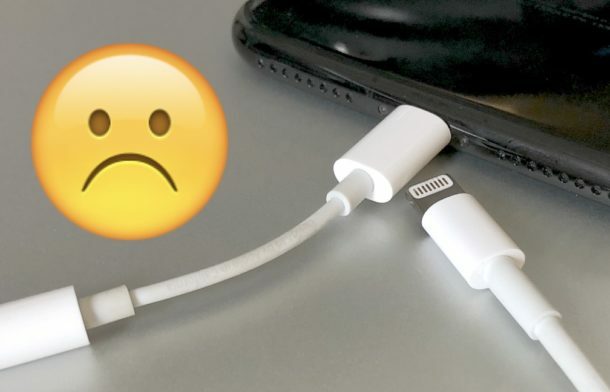 But, using that dongle means the lightning port is taken up, which is also how you charge the iPhone. Thus, if you want to listen to music via a 3.5m audio source while also charging an iPhone, you’re out of luck since the lightning port is occupied by the aux-to-lightning dongle. Or are you? Rather than replace all of your existing stereo equipment with Bluetooth interfaces, you can instead rely on a simple third party offering that splits the single Lightning port into a separate Lightning port and 3.5mm headphone jack. This is a great solution to users who have a lot of AUX compatible audio sources who routinely rely on the 3.5mm audio port for connecting a stereo or speaker system to an iPhone, while still having the ability to keep the iPhone plugged in to a power source for charging. These dongle solutions will effectively solve the listening to music via a 3.5mm AUX cable while charging an iPhone simultaneously problem, something that a substantial number of iPhone owners experience in their car stereos and home audio systems. You can find other similar adapters available on Amazon as well, but you’ll notice some of the much cheaper adapters are rated incredibly poorly and many of the reviews suggest they either don’t work at all, or fail quickly. Thus if you’re interested in a splitter cable like this, it’s probably best to spring the extra bucks for the higher quality and well-rated Belkin model. Another option is to buy more of the AUX to Lightning dongles for every 3.5mm AUX cable you use, and then just hot-swap a charger cable when needed to power a device up, but that won’t solve the listen-while-charging issue which is a pain point for some audiophile iPhone owners. Or you could simply upgrade every speaker system you have to a Bluetooth stereo or Bluetooth receiver, whether in the car or at home. But that’s going to probably be more expensive than a $40 adapter. Of course if you primarily listen to music from an iPhone over Bluetooth to a stereo system (car or speakers) then you can always just keep the iPhone plugged in via the single lightning port, and it will charge as usual. But if you use a lot of 3.5mm audio cables still, this just might appeal to you, so head on over to Amazon or Belkins website and grab one of the splitter adapters and you’ll be able to use an AUX port and lighting port simultaneously again. Thanks to Keith for the tip idea! 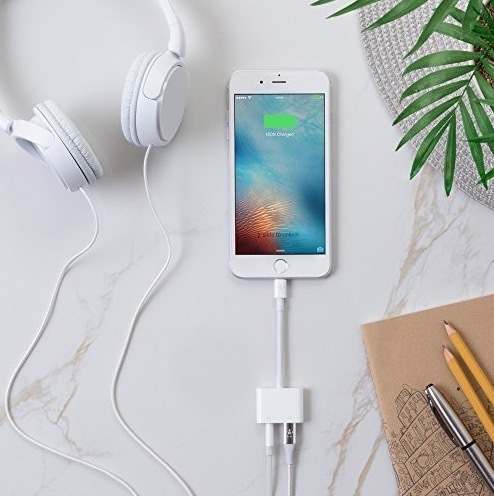 If you have any other solutions for charging an iPhone while listening to music simultaneously (and not just relying on Bluetooth), then share them with us in the comments below. What amuses me is that Apple still sells the iPhone 6S and SE which have a headphone jack, and that all the iPads and MacBooks still have one. There’s nothing amusing about that at all; just pure greed to sell more AirPods. I thought that and immediately sent them a feedback saying just that. Their logic is that everyone is using BT for listening but I pointed out that anyone interested in good sound prefers a wired headphone/earbud of higher quality. Certainly not interested in the mediocre and expensive AirPods. iPhone 8 or above just use a charging pad! One can add a QI charging case to any iPhone but all except the X use the slower charge rates. Not all chargers are capable of the faster rate either. What about listening music with headphone supplied by Apple while charging the phone simultaneously from a power bank? This problem is never brought out by any one. Why not two lightning port dongle be supplied by Apple? Why should we depend upon the Belkin dongle? Yeah, there’s an adapter for that. With this and everything else I think I am done with Apple. Check the Belkin device on Amazon. Only 46% 5 star and 26% (!!) 1 star. Something is wrong with this device it would seem. Belkin being a reliable company, I’ve purchased many different devices from them. But I did go through three adapters, all replaced by the Apple store. One was due to the cord wearing where it enters the device- a known problem with many device. The others were due to chip failure (I guess as they dropped one feature after another). The only problem with these adapters is they don’t allow you to make phone calls using the 3.5mm device. I used to use my Bose headphones as my headset but that’s no longer an option while charging even with the adapter. Interesting, I have stuck with the SE as I still like the form factor, but have never used the headphone jack. I normally use Bluetooth headphones – you can also make and receive phone calls this way. If you look back in history, Apple has always made unpopular moves – like doing away with the floppy disk, then the CD/DVD drive. ALl the others eventually follow. In all honesty as well, if you are paying £1000 for a phone – you can afford an adapter anyway – just saying. This is what’s known as a “false syllogism”. Or at Apple, what’s known as “courage.” To the rest of the world, it’s “marketing”. The 1/8″ stereo mini headphone jack will be around long after you and I. Can’t say the same for storage media. Moreover, a cable connection won’t lose signal, lose a charge, and will always sound better (if that’s something you care about). I stopped listening to music entirely on my iPhone after they pulled the headphone jack. My car stereo has AUX, and so do my three different home stereo systems. I tried the dongle thing a few times, but you end up misplacing it or losing it, or forgetting it. Ultimately you just stop using the iPhone for music, is that the effect Apple wanted? Also Apple Music is terrible and it’s beyond belief to charge monthly for a service after you spend $1000 on an iPhone, and then have to pay even more for iCloud to backup. The new Apple caters to shareholders, not the user. If Apple doesn’t think the user will eventually revolt and go elsewhere the moment the grass is ever so slightly greener, they should look at Microsoft in the 90s and what happened in the 2000s. I found some surprisingly well made splitter cables on e-bay. The only downside was that they lightning cable was wired for charging only, so could not be used with third part accessories such as my LKMultimedia iRig Pro, which also send data to the iPhone. I wonder if the Belkin dongle would work with that? My God, are they paying you by the word? All you needed to say = 2 sentences! Post Jobs Apple where it’s all about getting as many consumer dollars as possible and not give a crap about product quality or customer satisfaction. Same is true of the tunderbolt ports on Apple computers, replacing everything except USB. This is why most professionals doing audio and video have either switched to Windoze or using Hacintosh’s. The numbers may not reflect, but we who are true Apple users know we are witnessing the slow, painful death of Job’s dream. EXACTLY. I just lost a staring contest to a brand new iMac Pro because it has USB C, and my 2014 MacBook Pro has Thunderbolt 2, which meant transferring data with the fastest cables I already own are USB 2. In the rest of the world, there would be a legacy TB2 port on there called a “courtesy outlet”. It’s called that for a reason. Meanwhile, I’m on day-2 of Dropbox syncing all my files. I’ll just stick with my iPhone 6S. Heck, I’ve even contemplated switching to Samsung because I’m so tired of all these dongles and adapters that Apple wants people to buy.